Draft: 2006, St. Louis Cardinals, 28th rd. Originally drafted by the St. Louis Cardinals in the 28th round (856th pick overall) of the Major League Baseball June 2006, First-Year Player Draft...Graduated from Morton High School in Berwyn, Illinois...Played college baseball for St. Xavier University (IL) on the South Side of Chicago...Named Chicagoland Collegiate Athletic Conference (CCAC) and NAIA Regional VII Player of the Year in 2006 after pitching to a 3-1 record with an 0.68 ERA with nine saves while batting .330 with a team-leading 49 RBI and 12 stolen bases in 58 games while playing right field...Was inducted into the St. Xavier University Hall of Fame in 2014 along with his former coach Mike Dooley...The pair were both on the 2006 Cougars squad which advanced to the NAIA World Series for the first time since 1988...Luke and his wife, Lindsey, reside in Park Ridge, Illinois, with their son, Logan John, and daughter, Liv Grace. Missed 128 games over three disabled list stays...Began the season on the 10-day disabled list...Missed 16 games (3/264/15) with a left hamstring strain, 52 games (5/16-7/11) with a right shoulder impingement and 60 more games (7/26-end of season) with a right shoulder impingement...Made his first appearance as a member of the Cardinals at CHI (4/19) pitching two-thirds of a scoreless inning...Recorded two Holds (4/21 vs. CIN & 5/4 vs. CHI)...Had a stretch of five scoreless appearances (4/29-5/7) covering 4.1 innings, his longest stretch of the season...Posted a positive reverse split vs. left-handed batters with a .190 BA (4-21) and one home run...Held opposition to a .174 BA (4-23) with one extra base hit (double) at Busch Stadium with a 2.84 ERA...Worked on consecutive days four times in 2018...Was most efficient working consecutive games not allowing a run and only one hit in four appearances (3.2 IP)...Posted season-highs with 32 pitches and 1.1 innings at CHI (7/21-Game 1 of DH). Helped the United States win their first World Baseball Classic title making four scoreless relief appearances without allowing a hit and he recorded three saves ... Was on the Opening Day roster for his ninth consecutive season and was on the active roster all season ... Made 65 appearances during the regular season, his eighth season (of nine total) when making at least 60 appearances. Joined Tyler Clippard, David Robertson, Brad Ziegler and Fernando Rodney as the only Major League pitchers with eight 60+ appearance seasons since 2009 (Gregerson's debut) ... Finished the season with a 4.57 ERA (31 ER/61.0 IP), his highest ERA in any of his nine career seasons ... Struck out 70 batters in 61.0 innings (10.33 strikeouts per 9.0 innings). The 70 strikeouts were his most since 2012 (San Diego, 72) ... Enjoyed success away from Minute Maid Park, going 1-1 with a 3.29 ERA (10 ER/27.1 IP) and 34 strikeouts in 27 outings on the road ... Had three scoreless appearances (April 3-6), before giving up a career-high six runs on five hits in only 0.1 of an inning vs. KC (4/8). Gave up two homers, marking only the third time in his career when allowing two HR in an outing. His ERA on the season not including his six runs allowed on April 8, was 3.71 (25 ER/60.2 IP) with a .242 opponent batting average ... Following the 4/8 outing, threw eight consecutive scoreless outings (7.1IP) to finish off the month of April ... Won his first game of the season vs. DET (5/25), despite also taking a blown save ... Notched his only save of the season vs. SEA (7/18), pitching 1.1 scoreless innings. The one save was his single-season low since 2011 with the Padres when he had none ... Was scoreless in 23-of-27 outings (5/9-7/22) and owned a 1.69 ERA (5 ER/26.2 IP) with 36 strikeouts and a .177 opponent batting average in that span dropping his ERA to a season-low 3.76 ... 2017 POSTSEASON: Made five scoreless postseason appearances: two in the ALDS vs. BOS, one in the ALCS vs. NYY and two in the World Series vs. LAD. Yielded only two hits in his 3.2 combined innings. Was once again one of the most effective relievers in the AL in what was his second season with the Astros...led the Majors in swing-and-miss percentage, as 42.6% of all swings against him were whiffs (min. 200 batters faced)...was the second-highest mark by an Astros pitcher since 1988, behind a 48.1% mark set by RHP Brad Lidge in 2004...among AL relievers, ranked fifth in opponent batting average (.183, 38x208)...was the second-lowest mark of his career behind a .170 opponent average (47x276) he posted in 2010...ranked sixth among AL pitchers in opponent batting average against right-handed hitters (.156, 17x109, min. 100 batters faced)...also ranked eighth all-time in club history for a single season (min. 100 batters faced)...was the lowest mark produced by an Astro since RHP Jose Valverde put up a .144 opponent average vs. righties in 2009... struck out 67 batters, his most since 2012 (72)...also posted a 29.1% strikeout rate and 10.46 strikeouts per 9.0 innings ratio, which were both his highest marks since 2010 (30% and 10.23)...ranked 10th among AL relievers with a career-high 61.4% groundball rate...posted a 0.97 WHIP, marking his second-consecutive season with a WHIP under 1.00...was one of six AL relievers to post a WHIP under 1.00 in the 2015 and 2016 seasons, joining LHP Zach Britton, RHP Koji Uehara, RHP Roberto Osuna, LHP Andrew Miller and RHP Nate Jones...was placed on the family medical emergency list on June 14...reinstated from the family medical emergency list on June 17... placed on the 15-day Disabled List on Aug. 2 (retroactive to July 28) with a left oblique strain...was activated from the DL on Aug. 12...earned the save on Opening Day (April 4 at NYY), becoming the third pitcher in club history with two career saves on Opening Day...also LHP Billy Wagner (3) and RHP Dave Smith (2)...had a streak in which he converted 16 consecutive saves from Aug. 12, 2015-May 6, 2016...was the longest consecutive saves streak by an Astro since RHP Brandon Lyon saved 16 straight in 2010...picked up the win in three consecutive outings from June 23-27...became the seventh pitcher in club history to record a win in three consecutive relief outings, and the first since RHP Doug Henry in 1998...recorded a strikeout in a career-long 17 consecutive games from June 4-July 19...fanned 25 batters in 16.1 innings (13.78 SO/9) in that span...was the longest streak by an Astros reliever since RHP Jerome Williams had a 17-game streak in 2014. Joined the Astros in the oﬀseason as a free agent and was immediately installed as the club's closer...in what was his ﬁrst season as a closer, successfully converted 31 of his 36 save opportunities(86.1%), posting a 7-3 record with a 3.10 ERA (21ER/61IP), 59 strikeouts and 10 walks in 64 appearances...ﬁnished 10th in the AL in saves...ranked tied for second among AL relievers in wins behind only RHP WadeDavis (8)...recorded the most saves by an Astros reliever since RHP Jose Valverde saved 44 games in 2009...became the second pitcher in club history to record seven wins and 31 saves in a single season, joiningRHP Doug Jones, who won 11 games and saved 36 in 1992...marked his seventh consecutive season with atleast 60 appearances...also marked the seventh consecutive season he posted an ERA below 3.25...set twoclub records, as the Astros won each of the ﬁrst 21 games in which he appeared...marked the longest startof season streak in club history (previously RHP Donne Wall: 10 games in 1996)...also marked the longeststreak by a player to begin his career with the Astros, surpassing RHP Roger Clemens (7g in 2004) and RHPPeter Munro (7g in 2002)...held right-handed hitters to a .189 (20x106) batting average...the only Astrosreliever since 1974 to hold righties to a lower batting average for a single season (min. 70 BF) was LHPTony Sipp in 2014 (.176, 16x91)...ranked sixth among AL relievers and set a new career high in groundballpercentage (61%)...marked the ﬁfth-highest groundball percentage produced by an Astros reliever sincethe stat was ﬁrst tracked in 1987, and the highest since RHP Enerio Del Rosario in 2011 (61.9%)...made hisseventh consecutive Opening Day roster...placed on the Family Medical Emergency List from May 9-12and was inactive for three games...missed three games from Sept. 16-18 for the birth of his son...becamethe 11th pitcher in club history to record a save on Opening Day, as he closed out Houston's 2-0 victoryagainst the Indians at Minute Maid Park on April 6...prior to Gregerson, the last to do it was LHP Erik Bedardon March 31, 2013 vs. TEX...began his season with seven consecutive scoreless outings (April 6-20)...theonly other closer to begin his career with the Astros with a scoreless streak of at least seven games wasRHP Doug Jones in 1992...allowed a home run to Logan Morrison on May 1 vs. SEA, which was the ﬁrsthomer he allowed to a left-handed hitter since Sept. 3, 2012 at LAD (OF Andre Ethier)...had gone 169 gameswithout allowing a homer to a lefty...recorded his 12th save of the season on May 26 at BAL...tied a clubrecord by recording 12 saves within the Astros ﬁrst 46 games of a season...this has been done six times infranchise history, most recently by RHP Brett Myers in 2012...recorded nine saves in May, which ranked tiedfor third in the AL and tied for third in club history with RHP Fred Gladding (1969)...the only two pitchersto compile more saves in a single May were LHP Billy Wagner (11 in 2003) and RHP Jose Valverde (10 in2008)...his longest scoreless outing of the season was a 13-game stretch from June 13-July 24 in whichhe went 1-0 with six saves and held opponents to a .119 average (5x42) and .262 OPS...was his longestscoreless streak since a 15-game run from June 27-Aug. 8, 2014 while with Oakland...recorded his longestouting of the season with 2.0 scoreless innings on Aug. 18 vs. TB...was his longest outing since June 6,2014 at BAL (2IP)...was scoreless in 34 of his last 39 games of the year, going 5-2 with 16 saves, a 2.19 ERA(11ER/37IP) and 32 strikeouts...pitched in four postseason games, recording three saves while posting a2.25 ERA (1ER/4IP) and six strikeouts...became the ﬁrst pitcher in club history to record a save in each of hisﬁrst three postseason appearances with the club...recorded the save in the AL Wild Card Game at NYY witha perfect 9th inning, and recorded the save in Games 1 and 3 of the ALDS against the Royals...recorded afour-out save in Game 3 of the ALDS vs. KC, his ﬁrst four-out save since Sept. 11, 2012 vs. STL while with SanDiego...joined RHP Brad Lidge (NLCS Games 2, 3, 4) as the only pitchers in club history to record a save inthe postseason by throwing more than one inning...signed a three-year deal with Houston as a free agent on Dec. 12, 2014. Compiled a career-low 2.12 ERA in 72 relief appearances in his first season with the A's…the games pitched tied for the team lead and tied for 10th in the American League…it marked the fifth time in his career he pitched in at least 70 games…had appeared in at least 60 games in each of his six seasons in the Majors…became one of five Major Leaguers to pitch in at least 60 games in each of the last six seasons (2009-14) (Breslow, Papelbon, Thornton, Ziegler) and his 435 games pitched over that span are the most in the majors…walked 15 batters in 72.1 innings for a career-low 1.87 walks per nine innings…allowed a .220 opponents' batting average, which included .219 (33x151) against right-handed hitters compared to .221 (25x113) against left-handed hitters…surrendered all six of his home runs in 2014 to righties for a .397 slugging percentage…had a .265 slugging percentage against lefties…had not allowed a home run to a lefty since Sept. 3, 2012, at LAD (OF Andre Ethier)…yielded a .173 batting average with runners in scoring position…the opponents' clean-up hitter was 5x42 (.119) with one extra base hit off him (home run)…had a 2.88 ERA and .242 opponents batting average over his first 25 appearances, a 0.91 ERA and .176 opponents average over his next 29 outings from May 27- Aug. 8, and a 3.06 ERA and .254 opponents' average over his final 18 games beginning Aug. 10…had a 0.87 ERA in 23 appearances on no days rest, a 2.61 ERA in his other 49 games…compiled a 1.81 ERA in 46 games at night compared to 2.78 in 26 appearances during the day…had a career-high six wild pitches, which tied for fifth most among AL relievers…averaged 13.9 pitches per inning, which ranked fourth lowest among AL relievers…tossed at least one inning in 63 of his 72 appearances. Went 6-8 with four saves and a 2.71 ERA in a team-leading 73 games in his fifth and final season with San Diego…topped 70 games for the fourth time in the last five years and has appeared in at least 61 games in each of his five seasons…had career highs in wins, losses and hit batters (4)…tied for first among National League relievers in losses (8), tied for third in triples (3) and tied for sixth in wins (6)and hit batters (4)…allowed a .203 opponents batting average, including .192 (24-for-125) against righthanded hitters compared to .216 (25-for-116) against left-handers…has a .191 (137-for-718) average against right-handers in his career…surrendered all three of his home runs in 2013 to righties … issued 12 of his 18 walks to lefties…was 4-2 with a 0.91 ERA and .140 opponents batting average over his first 29 games through June 8, 1-5 with a 7.71 ERA and .329 opponents average over a 25-game stretch from June 9 to August 15, and 1-1 with a 0.50 ERA and .136 opponents average over his final 19 contests … first batters faced were 13-for-70 (.186) with just three walks and his .219 on-base percentage against first batters ranked seventh in the NL…tied for ninth in first batter strikeouts (20) … allowed 5-of-19 (26.3%) inherited runners to score…was charged with five blown saves, which tied for seventh in the NL…did not induce a grounded into double play and his 66.1 innings pitched were the most in the majors among pitchers with no GIDP…they were also the most in San Diego history … opponents hit .161 with the bases empty and .265 with runners on base, including .290 with runners in scoring position…did not allow a run in three appearances against Cincinnati (2.2 ip) and has not allowed a run in 15 career outings against the Reds (18.0 ip)…compiled a 4.12 ERA in 44 outings on zero or one days rest … had a 0.67 ERA in 29 outings on two days rest or more…posted a 2.03 ERA and .179 opponents batting average in 51 games at night compared to a 4.58 ERA and .265 opponents average in 22 day games…logged a 0.71 ERA in 14 games against NL Central competition … opponents were 10-for-10 in stolen base attempts and they are 28-for-30 (93.3%) off him in his career … tossed at least one inning in 54 of his 73 appearances…had just two outings longer than 1.1 innings. SAN DIEGO: Struck out a season-high three batters April 4 at New York (NL)…tossed 15.1 consecutive scoreless innings over a 16-game stretch from April 24 to May 31…held the opposition to a .061 batting average over that span…tossed a season-high 2.0 scoreless innings May 31 against Toronto…did not allow a run in 12 games (11.1 innings) in May and opponents hit .081 … his season ERA stood at 0.76 at the end of May but he posted a 6.55 ERA in 14 appearances in June … however, logged three of his four saves over a seven-game stretch from June 1 to 11…matched his season high with 2.0 scoreless innings and three strikeouts June 6 at Colorado … allowed a season-high three runs on a career-high tying four hits in 0.2 innings June 9 at Colorado … matched his high in hits June 19 at San Francisco…allowed a pinch hit walk-off home run to Jonny Gomes in the bottom of the ninth inning July 3 at Boston…that was his third and final home run of the season…finished the season with a 34-game, 30.2-inning, 124-batters faced homerless streak …walked two batters Aug. 15 against New York (NL), his only outing with more than one walk…allowed two runs in that game but would not allow an earned run in 18 of his final 19 appearances … compiled a 0.69 ERA in 14 appearances in September. Posted a career-best 2.39 ERA (19 ER/71.2 IP) and a career-high nine saves over 77 outings for the Padres. His 77 games were tied for sixth-most among all NL relievers.In 43 relief appearances at home, went 1-0 with a 1.49 ERA (7ER/42.1 IP) and a .179 (26-for-145) opponents batting average,with five saves in six opportunities.After the All-Star Break, posted a 1.10 ERA(4 ER/32.2 IP) and a.189 (23-for-122) opponents batting average with nine saves in10 opportunities over 35 outings...in the first half, was 2-0 with a3.46 ERA(15 ER/39.0 IP) over 42 outings.Posted a career-best 23.0 scoreless inning streak from 7/4-8/27,the longest streak by a Padre in 2012 and longest since RHP Kevin Correia posted a 23.1 scoreless inning streak in 2009.Worked scoreless ball in 65 of his 77 outings total on the season.Converted eight of nine save opportunities over a 10-game stretch from 8/26-9/15, with his only blown save andthe Padres only loss in that span on 9/3 at LAD.Converted his ninth save of the season on the Padres last game of the year 10/3 at MIL.Allowed seven home runs total on the year, with five of those coming in a 19-game stretch from 5/14-6/25 in whichhe posted a 5.19 ERA(10 ER/17.1 IP)...following that span, went on to post a 1.17 ERA(5 ER/38.1 IP) and a .190(27-for-142) opponents average from 6/26 through the end of the season.Recorded 72 strikeouts in his 71.2 innings pitched for a perfect 9.0 strikeouts per 9.0 IP ratio, the second-moststrikeouts among Padre relievers in 2012.Honored with the Darrel Akerfelds Bullpen Award following the season, given annually to the most outstandingmember of the Padres bullpen as voted on by his peers. Made 61 relief appearances for the Padres, including 11 games finished...Worked scoreless ball in 48 of his 61 outings...Missed 25 games while on the disabled list from 6/9-7/5 with a strained oblique...Posted a 4.01 ERA (11 ER/24.2 IP) in his 30 home games and 1.74 ERA (6 ER/31.0 IP) in 31 games on the road...Held right-handed hitters to a .225 average (29-for-129) while allowing a .329 average (28-for-85) average to lefties...Tallied 16 holds and allowed seven of 29 inherited runners to score (24 percent). Made a career-high and team-leading 80 appearancesfor the Padres, tied for the fourth most outings amongNational League pitchers...also tied with Cla Meredith (2007)for the third most outings for a Padre pitcher in franchisehistory...Set a new Major League record with 40 holds in 2010...broke theprevious record of 36, held by Scott Linebrink (2006) and Tom Gordon(2004), on 9/22 at LAD...Worked scoreless ball in 63 of his 80 outings and hitless ball in 48outings...Retired 26 consecutive batters from 4/14-27, setting a new Padresrecord (previous: 24 by Craig Lefferts in 1984)...Did not allow a walk to 110-straight batters faced from 4/14-6/18, the longest streak for a reliever in Padre history andlongest in the Majors for a reliever since Jonathan Papelbon (BOS) went 127-straight in 2008...After allowing three runs on 0.1 IP in his first outing of the season, went 1-1 with a 0.55 ERA (2 ER/33.0 IP), a .084 (9-for-107)opponents batting average and 40 strikeouts against just one walk (intentional) over his next 29 outings from 4/10-6/12...Posted a season-high 16.1-inning scoreless streak from 4/15-5/11, the second longest of his career (18.0-innings, 8/16-9/20/09)...Averaged 14.1 pitches per inning pitched, the third lowest average among all Major League relievers...His .170 (47-for-276) opponents batting average on the season was fourth lowest among all NL relievers...held right-handedhitters to a .162 (25-for-154) while lefties hit at a .180 (22-for-122) clip...Had a 2.14 ERA (10 ER/42.0 IP) and a .146 (21-for-144) opponents batting average in 39 outings at home, against a 4.46ERA (18 ER/36.1 IP) and a .197 (26-for-132) opponents average in 41 outings on the road...Recorded the 100th strikeout of his career on 4/19 vs. SF (Eugenio Velez)...Notched two saves in 2010, on 6/27 at FLA (1.0 IP) and 9/8 vs. LAD (1.2 IP)...Allowed the first home run of his career at PETCO Park on 5/14 vs. LAD (Matt Kemp), snapping a streak of 45 careeroutings (51.1 IP) without allowing a home run at home. Acquired from the Cardinals 3/23 to complete the deal that sent Khalil Greene to St. Louis...madehis Major League debut and appeared in a team-high 72 games...Worked scoreless ball in 57 of 72 appearances...Recorded two significant scoreless innings streaks, working 12.1 shutout frames 5/13-30 and a career-best 18.0-straightscoreless innings from 8/16-9/20...18.0-inning streak was the longest by a Padres reliever in 2009 and the longest activestreak in the Majors at the time...Allowed just three runs at home, posting a 0.65 ERA (3 ER/41.2 IP) in 37 outings...opponents limited to .136 average atPETCO Park...Posted a 6.48 ERA (24 ER/33.1 IP) on the road with opponents hitting .307...Placed on the disabled list 6/16 (retroactive to 6/8) with a strained right shoulder and was reinstated 7/6...Struck out 93 compared to 31 walks while limiting opponents to a .221 average...surrendered three home runs, includingjust one over his final 41 outings...Ranked among all NL relievers in innings (9th), strikeouts (T3rd) and holds (T2nd, 27)...Ranked among NL rookie relievers in games (2nd), innings (2nd), strikeouts (1st), holds (1st), ERA (5th) and opponentaverage (6th)...Allowed just five of 27 inherited runners to score (18.5 percent)...Recorded his first Major League save 9/24 at COL, working 1.2 scoreless innings...Ranks on the Padres all-time rookie reliever lists in games (4th), innings (T10th) and holds (2nd). Pitched the entire season for Double-A Springfield in the Cardinals organization...named to theTexas League All-Star Game...Went 7-6 with 10 saves and a 3.35 ERA (28 ER/75.1 IP) in 57 relief appearances for Springfield...struck out 78 comparedto 26 walks...Allowed just two earned runs in 22.0 IP (0.82 ERA) spanning 19 outings for Margarita in the Venezuelan Winter League. 53 games pitched for Rookie-level Palm Beach were second most in the Florida State League...Ranked third in the FSL with 29 saves, 43 games finished and average runners allowed per 9.0 IP (8.86)...opponents batted.183 against him, ranking him third among all relievers...Named Pitcher of the Game at the FSL All-Star Game as he struck out the only two batters he faced...named an FSL PostseasonAll-Star...Named the Cardinals Pitcher of the Month for August, as he did not allow a run over 13.2 IP spanning 12 appearances whilegoing nine-for-nine in save opportunities. Split the season between Rookie-level Johnson City and Single-A State College...converted ninesave opportunities between the two stops...With five saves and a 3.86 ERA (7 ER/16.1 IP) in 15 relief appearances for Johnson City...struck out 24 compared to sixwalks...6-1 with four saves and a 1.72 ERA (3 ER/15.2 IP) in 12 relief appearances for State College...struck out 22 compared tonine walks...Did not allow a home run in 32.0 combined innings. April 19, 2019 St. Louis Cardinals sent RHP Luke Gregerson on a rehab assignment to Memphis Redbirds. April 16, 2019 St. Louis Cardinals sent RHP Luke Gregerson on a rehab assignment to Springfield Cardinals. April 15, 2019 St. Louis Cardinals sent RHP Luke Gregerson on a rehab assignment to Palm Beach Cardinals. 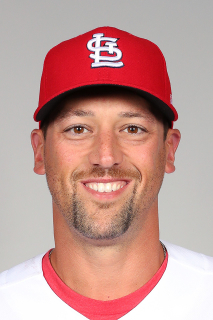 April 12, 2019 St. Louis Cardinals sent RHP Luke Gregerson on a rehab assignment to Springfield Cardinals. April 4, 2019 St. Louis Cardinals sent RHP Luke Gregerson on a rehab assignment to Palm Beach Cardinals. March 25, 2019 St. Louis Cardinals placed RHP Luke Gregerson on the 10-day injured list. Right shoulder impingement. November 1, 2018 St. Louis Cardinals activated RHP Luke Gregerson from the 60-day injured list. August 11, 2018 St. Louis Cardinals transferred RHP Luke Gregerson from the 10-day disabled list to the 60-day disabled list. Right shoulder impingement. July 30, 2018 St. Louis Cardinals placed RHP Luke Gregerson on the 10-day disabled list retroactive to July 26, 2018. Right shoulder impingement. July 13, 2018 St. Louis Cardinals activated RHP Luke Gregerson from the 10-day disabled list. July 6, 2018 St. Louis Cardinals sent RHP Luke Gregerson on a rehab assignment to Springfield Cardinals. July 6, 2018 St. Louis Cardinals sent RHP Luke Gregerson on a rehab assignment to Memphis Redbirds. July 1, 2018 St. Louis Cardinals sent RHP Luke Gregerson on a rehab assignment to Memphis Redbirds. June 30, 2018 St. Louis Cardinals sent RHP Luke Gregerson on a rehab assignment to Memphis Redbirds. May 16, 2018 St. Louis Cardinals placed RHP Luke Gregerson on the 10-day disabled list. Right shoulder impingement. April 16, 2018 St. Louis Cardinals activated RHP Luke Gregerson from the 10-day disabled list. April 7, 2018 St. Louis Cardinals sent RHP Luke Gregerson on a rehab assignment to Palm Beach Cardinals. March 28, 2018 St. Louis Cardinals placed RHP Luke Gregerson on the 10-day disabled list retroactive to March 26, 2018. Left hamstring strain. December 14, 2017 St. Louis Cardinals signed free agent RHP Luke Gregerson. November 2, 2017 RHP Luke Gregerson elected free agency. August 12, 2016 Houston Astros activated RHP Luke Gregerson from the 15-day disabled list. August 2, 2016 Houston Astros placed RHP Luke Gregerson on the 15-day disabled list retroactive to July 28, 2016. Left oblique strain. June 17, 2016 Houston Astros activated RHP Luke Gregerson from the bereavement list. June 14, 2016 Houston Astros placed RHP Luke Gregerson on the bereavement list. May 12, 2015 Houston Astros activated RHP Luke Gregerson. May 8, 2015 RHP Luke Gregerson roster status changed by Houston Astros. December 12, 2014 Houston Astros signed free agent RHP Luke Gregerson. October 30, 2014 RHP Luke Gregerson elected free agency. July 5, 2011 Luke Gregerson roster status changed by San Diego Padres. July 2, 2011 Luke Gregerson assigned to Tucson Padres. July 1, 2011 sent RHP Luke Gregerson on a rehab assignment to Tucson Padres. June 9, 2011 San Diego Padres placed RHP Luke Gregerson on the 15-day disabled list retroactive to June 7, 2011. Strained left oblique. July 6, 2009 San Diego Padres activated RHP Luke Gregerson from the 15-day disabled list. June 16, 2009 San Diego Padres placed RHP Luke Gregerson on the 15-day disabled list retroactive to June 8, 2009. Strained right shoulder.